Are you a “creeper”? I know I am. I creeped every Pinterest post I could find about Minecraft and man was that overwhelming. When I started out, I knew nothing about Minecraft and I think my son had just as much fun coming up with ideas as I did. I handed him Pinterest and he handed me back a board full of 120 pins. Here are our favorites that we used and links to make them yourself all in one place. 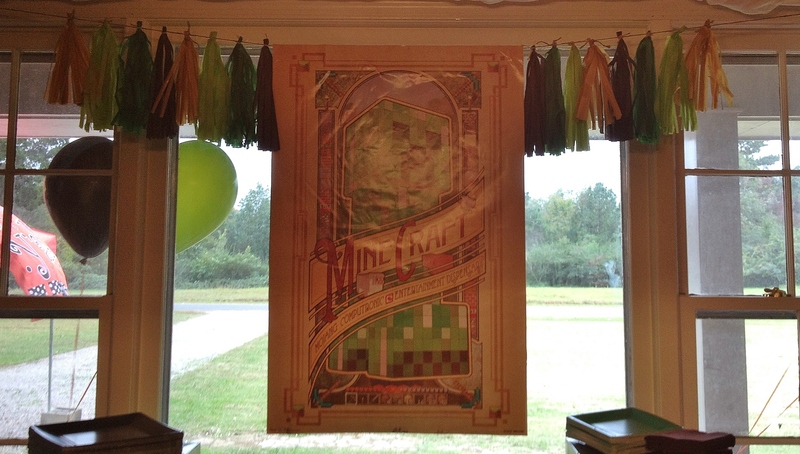 A whole Minecraft party in one spot. Let’s start with things you can do in advance. Gift wrapping. Green wrapping paper, red wrapping paper and craft paper.I used these images and cut them out and pasted them to the kraft paper. http://www.fps-x-games.com/2014/01/create-your-own-stampy-mask.html#more and http://www.fps-x-games.com/2013/06/free-minecraft-steve-head-printable-mask.html. The TNT was his favorite, red paper, white paper and wrote out TNT. GOODIE BAGS! Always a big hit. Green bags with creeper faces. http://t3hn3w13.deviantart.com/art/Creeper-Face-264253433 I printed it out, cut out the face with exacto knife and used it as a template. Backdrop for the food table. This was my favorite thing to make and probably the tastiest! It was a huge hit. Homemade creeper peeps. I made the “cake pops” on Wednesday and also stored in a container until Saturday. I did refrigerate these. They were also a huge hit. All the kids loved them and once all the adults realized it was snickers they loved them too. On to the cake. I made the cake on Friday and the dirt block was so easy. I wish I could make a dirt cake every year. For beverages we made “Lava” punch and “Creeper” juice. The creepers are juice green mondo juice with creeper faces drawn on them and the lava punch was delicious. Adults and children alike both raved about it. Here is the recipe: 2 containers of vanilla & orange sherbet and 2 bottles of strawberry soda. Now for the rest of the party food. Grass block brownies: Used a brownie pan so they were perfect squares and just topped with green icing. Rice Krispie Creeper Treats: Green food coloring added to homemade treat mix. Topped with creeper faces made of chocolate. I printed out the creeper faces again. (Just resize to suit yours) Top with wax paper and pipe out melted brown candy melts. Creeper cookies: Square sugar cookies topped with green royal icing. Allow to dry and top with creeper faces again. Creeper pizza: Digorno pizza sticks baked mid way then I top with pepperoni’s and put back in to finish baking. Made perfect creeper faces. Hope this has helped some other moms with minecraft addicts in their home. It was a great party and I am sure yours will be too! I don’t know how you are constantly coming up with these difficult birthday party themes. Awesome job here!